Having my first listen as I write this. These speakers were years ahead of their time. Fantastic ! SERVOLINEAR is backed by a German manufacturer that combines international know-how with intensive research and high-quality technology. SERVOLINEAR ML 1 The speaker convinces in this price range by unusual balance, space and speed.The SERVOLINEAR ML 1 A extends the enjoyment of music even on “simple” amplifiers significantly, their amazing reserves are discovered when using the highest quality electronics. 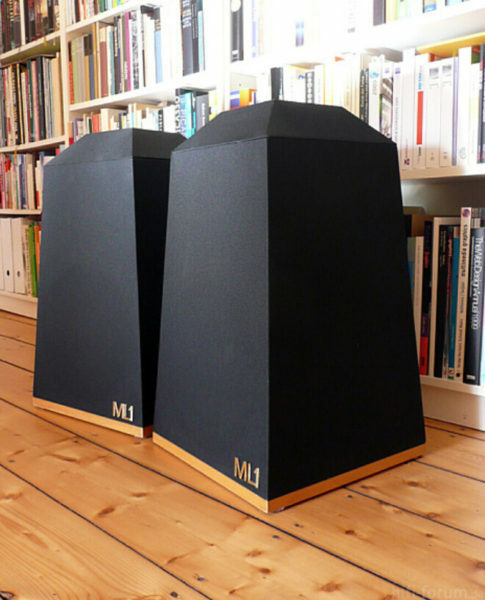 The difference to other speakers lies in the technical sophistication: despite three different chassis eliminates the phase-distorting crossover. The passive servo bridge circuit used has no coils and capacitors. It suppresses resonances and prevents impedance peaks. The piezoelectric tweeters combine many advantages: the radiation characteristic is hemispherical, the frequency range from 12 kHz to 27 kHz is almost ideal, and with extremely small moving mass, a previously unknown speed is achieved. Space adaptation problems are unknown. With mid and high range controls, the SERVOLINEAR ML 1 can be optimally adapted to virtually all rooms with a floor area of 10 – 250 sqm.